Well, that�s a dear friends� polite way to ask me. How could I let a friend down? The early evening that we came to do the investigation was lovely, encompassing one of those slight breezes that takes the heat off an otherwise hot summer California transition from day to night. The Crew of GOLD RUSH GHOSTS INTERNATIONAL PARANORMAL INVESTIGATIONS had been commissioned to check out the old house in Northern California�s little town of Camino. Situated between Sacramento and Tahoe, Camino is a mountain community nestled in the trees, quaint and very rural. Things had been happening to the residents of the home, and they needed answers. We were on the trail! This particular home had been in the family for many years. The current occupants were the grandchildren of the owner, along with the wife of one of the brothers, and their long time friend as mine, Joey. We were previously educated on email about the site. The home was originally a mill house on the Michigan-Cal lumber mill, in fact the mill foreman�s house. It was (many years ago) moved offsite to this location. The house was built in 1926, and the current occupants had lived here off and on since high school. They spoke of years of hearing voices when no one was around, about the upstairs bedroom door opening when securely shut and finding no one around when investigating. At one point the residents told of someone putting white flour on the front porch and then they sat out in the front yard to watch and make sure no one walked up the porch. After a few hours, they gave up their vigil and decided to go inside. When they looked at the porch they saw footprints in the flour, made by boots. The prints looked like men's work boots, about a size ten, but there had been no person on the porch that they could see. Other strange occurrences were happening over the years, a bedroom door would open in the middle of the night, voices heard, but upon investigation, nothing and no one was about. Strange and spooky! One night a man, obviously in spirit, appeared to one of the occupants, and he was in the closet on one side of the master bedroom, and a little girl crying in another. Unnerving for certain for those not use to these things, common occurrences for GRG.I dispatched the investigators to the house and headed toward the backyard with Joey to do our �own� thing. This advanced investigation would be headed by seasoned investigators Danielle Carpenter and Cat Noble. Long time members of the team, they knew their stuff backwards and forward, having clocked many hours in investigations. Carpenter has a natural psychic gift, and Noble is a no-nonsense school teacher. Other investigators along for this adventure were: Robert Reppert (Owner of GRG and in charge of our million dollars worth of extensive equipment), Wayne Peterson, Laura Martucci, Tyson Sheedy, Cindy Wingard, the newest member of our team, investigator and filmmaker Scott Herrigstad bringing along two of his film crew, and of course me, the Celebrities Psychic and Life Coach Nancy Bradley. It is my goal to never allow or give psychic impressions until the investigation is over and �in the bag�. Unlike other paranormal investigation groups, we are a scientifically oriented organization, more known for doing government or sector work and television. Rarely to never to we take �civilians� around to our investigations and I will ONLY go in with psychic information after the crew is finished to see if I can substantiate their findings or if they run into a snag and need my assistance. As protocol, the first thing Cat did was set up cameras and equipment to conduct interviews at the site. She started with Kevin Watson, an articulate evaluator of fact from fiction, and the man that lives in the house beyond the �supposed� haunted one, separated only by a yard and without a fence. He was to tell us. �I originally moved into the front house when I was five years old. The toilet would flush when no one was around. It was one of those hand held pull toilets. Of course as a child I was always curious about that, certainly as a small child I was too short and did not have the strength to pull it when I was in the room. There were always the voices when no one was around too, strange things happening in that house. Back then there were these sounds, and they continue even now a bench grinding sound that is heard, especially at night. Beyond that, I remember the garage door would open and close by itself, generally some time between midnight and 3 am. Strange things were always going on in the kitchen too. So one night recently we set up a video recorder in the kitchen to see if we could catch what was going on. The recorder turned itself off just about the time we set it and left the room, and then turned itself back on just prior to the time we got up the next morning to look at it. It (of course) is blank space in the middle.� Eerie. �There is just so much unexplained going on without logical explanation� he told us. �There are lights that go on and off without assistance, and motion detectors that go off when no one is around. Bangs and unsettling noises are commonplace most all the time. The cupboards in the kitchen, hard to open and shut, we inevitably find open in the mornings, they just open by themselves.� At this point a crew member went to the cabinets to see if they were easily opened. They were not you had to pull on them. Kevin continued: �We did not give up trying to find out what was going on in this house. We plugged in cameras, video tapes, and they would go on and then there would be a second pause, maybe 10 seconds, and then they would go on again by themselves. No one pressed stop or play.� Its� baffling. Next to be interviewed by Cat was Justin Wixom who lived in the �mill house� most of his life also, and is a current occupant. A very interesting man, a former cop, we knew there was no BS going on when talking to him, he is as we are, cut and dry, black and white factual kind of guy. He was able to confirm and substantiate all the stories told to us by Kevin. �I lived here as a child with mom and six siblings starting in the late 1970�s. He spoke about his current dog Rocky who behaves strangely at certain times. We were told he growls at nothing (and he's not a growling dog by nature,) barks at nothing, and refuses to come inside the house when they are not home. "There are times he will not come down the hallway to the living room/kitchen area when it's dark." When this all started they were keeping him in the bedroom at night and that's when things started happening where they would hear things on the stairs. "At first we would think it was him, but then remember he was in the room with us. Other times he would walk upstairs to our room just fine. he seems to prefer to station himself in the hallway at the top of the stairs between our room and the kid's rooms. Sometimes he will run up and down the hall like he is chasing something." When the dog acted strangely they would investigate. No one was there. "Also" Justin told us, "We would close the door to the master bedroom tightly, and yet it would open by itself." Justin stated. He looked around in thought, �I can tell you that most of the activity is between midnight and 4 a.m., or at least that is when the house is quiet and we notice it more. At 3:00 am we will hear the kitchen draws slam. When we investigate, no one is there. It is more than once that we saw a shadow of someone crossing into our daughter�s room. We have also heard a voice...a woman�s voice, screaming at 5:30 a.m. As you can see we live in the woods, but we would still go outside to investigate even though the sounds appeared to be coming from inside. Nothing unusual was found.� He was to also tell us that there was an early morning incident where he went outside to get into his car and felt something brush against him. Again, nothing (he could see) was there. Interested now, Cat called in Justin�s wife Julie. She spoke easily to us of being uncomfortable in her master bedroom. She spoke of being a photographer and journalist, and from this background she was very curious as to what was going on. We soon found that she obviously had an underdeveloped and as yet untrained natural psychic gift, and I was anxious to give her the answers to what she was feeling, both things from her subconscious to those that she caught with her psychic ability. She started talking to Cat. �Someone recently called my name when I was outside the building on the RV pad. It was evening. I looked around and there was no one there.� She said it gave her a shutter as well it would, being out in the woods, thinking you are alone, and hearing someone call to you that you could not see. �On another evening I woke up seeing a little girl in our bedroom with dark hair about seven/eight years old. She was very clear to me, wearing a white smock dress and sandals. I was startled at seeing someone there, and when I abruptly turned around to get a closer look, she was gone. That little girl has stuck with me emotionally ever since then.� Having recently suffered a miscarriage she wondered if this was the child she was supposed to have. I assured her it was not. Another incidence made her even more familiar (if not completely comfortable) with ghost/spirit phenomena. �I was either asleep or perhaps just waking up� she was to tell us, trying to make sense of an otherwise at this point unexplainable strange occurrence. �I looked around and saw the notepad I write on and keep beside the bed on the floor. When I picked it up I saw that there was writing on it in my handwriting, but I don't remember writing it. I thought I might have been writing in my sleep somehow. I thought it could have been a form of sleep writing, something which I had never experienced before. I have a very well documented tendency toward sleepwalking and talking though, and being a writer this is not much of a leap for me. I may have been communicating with a spirit, but I believe that I intentionally, though subconsciously, write on that pad." Well, could be. She also stated that although she was certain the writing was hers, it was sloppy, messy, perhaps as a child would write. "I looked down at it carefully." she said. "What was written was: �How do you know my name?'" Certainly disarming! She took a deep breath as she continued talking to us. �I remember other things that happened also. There are such things as hearing a voice beside a bedside lamp, hearing screaming, sounds of a child giggling, laughing.� She remembers distinctly on several occasions where she or another occupant of the house had locked the front door before retiring, finding it still locked in the morning, yet over night they heard distinct front door slams. When tested, the sounds were clearly the sounds of the front door slamming." Music is also heard in the master bedroom. Hum! We needed to investigate. �Upon entering the home, I asked the resident Justin if he could take Cat and I through the house first to get an idea of what the lay out was before we did anything.� This is standard procedure for GRG. Danielle continued: �As we walked through the home, I could just tell by the layout it had a lot of history. I did ask if there had been any add on to the home since the layout was so different and he had said not since they had lived there in the late 70�s. The downstairs did not seem to generate any serious vibes for me, but when we were upstairs going from Justin�s children�s rooms into the master bedroom across the hallway I did get a sense that both a girl and boy spirit had been in the hallway and back into both children�s rooms and I felt a wave of energy that constantly moved back and forth down that main upstairs hall. There was also a heavy energy in the Master, but I did not attribute it to anything until later, when I went through the house with Cat again after the interviews. I did not want the interview to hinder my judgment, but it actually helped me tune into the heavy energy I felt upstairs to be male. Energy can be triggered heavier for males, and softer for females unless there is a trauma going on, and he being a male was substantiated by our meters. When I did go out there with Cat and Scott we tuned into an area by the master bedroom window that made everyone off kilter and dizzy. I mentioned to them I felt it could be a vortex. Luckily Nancy also come in and confirmed a vortex or portal there. I will say I had a slight fear of the corner closet near the vortex. I did not like the energy as it just kind of cold, unknown to me I guess. When Justin opened the door, the air in the closet was sooo cold, while the rest of the room was warm. I think Scott got an image of this on his camera. When approaching the other closet by the bedroom door, I knew there was a spirit in there, but I was not as fearful to open that door, and I did. This was the closet where the cubby was. The spirit of a girl child was in there, and I could feel she had a somewhat sober feeling, she was fearful. I had also asked her if I could get her name and the name given was Anna, perhaps Anna-belle or something to that effect. What was cool, is later I learned that both Nancy and the resident Julie also had gotten a name with Anna in it, so that was a confirmation for me. The longer in the room, the more I could see the male with dark clothes, and I also saw he wore a hat. �Upon arrival, Ty, Cindy and I went into the back yard. As soon as I arrived the new batteries went dead in my camera. I went back to my car and the batteries were fine.� (This is commonplace, spirits drain energy, we cannot tell you how many times we have this problem during an investigation, and when leaving the investigation the old batteries are in great working shape again). Wayne continued: �I picked up the spares anyway, and returned and the camera immediately died again. I replaced the batteries and then it worked fine. I felt nervous as I approached a shed on the right side of the yard and took several photos there. I also took pictures at the back right corner of the yard. We went inside for a quick tour and I felt light-headed when I reached the landing of the second floor. Also I had the chills when I entered the master bedroom. When we finally entered to do the testing, my infrared thermometer quit working in one corner of the master bedroom upstairs. I replaced that battery and the screen stayed off. As we moved into another room, the temperature meter worked fine. I went through 6 AA batteries and two 9 volt batteries during the investigation, a sure sign that spirits are about. Investigating notes of TYSON (TY) SHEEDY. �When we pulled up to the house my first impression was that this was the exact house I had pictured in my mind. On the drive up, we were talking about the house and I kept referring to the second story. Wayne asked me if we had been told it was a two story home. I said that we were not, but I though it would be. I also pictured a white picket fence around it. As I mentioned it to the people in the car on the drive up, it was conformation. When I got out of the car I immediately got a bad feeling. I can�t describe it. I was having trouble breathing and I felt claustrophobic, even though I was outside. �In the backyard, there were three hot spots. Joe told us that Nancy, when zeroing in earlier on an email conversation with him had pinpointed the shed as one. Wayne, Cindy, Laura and I picked up on that spot and several others we later found Nancy had also identified. At the spot in the middle of the yard, both Wayne and Laura�s camera batteries died. I was drawn to the northeast corner at the back of the yard. I got an image of a lady in her 40�s with brown hair drawn into a bun and frizzy curls around her forehead. She was wearing a white dress with a ruffle at the neck and a cameo pin. However, no meter picked her up. On our first walk through of the house, I had problems breathing at the bottom of the stairs and I didn�t like the feeling I was getting from the first floor bathroom next to the stairs. While we were waiting outside during the interviews, I was sitting in the car and I started having pains in my chest. I think it was related to the front yard. I got the feeling that bad things happened there and saw images of people being whipped. When we investigated the house, the master bedroom was very active. I was immediately drawn to the northeast corner. Its interesting to point out that this is the same area I was drawn to in the yard. Not sure what that means. I was taking notes while the others used their instruments. I asked Wayne to come over to the corner and get a reading. When he used his temperature gauge, it went blank and would not give a reading, a sure sign that the spirits about were draining the energy of the equipment and all and all being �ornery!� But, when we moved away, the equipment and cameras worked fine. 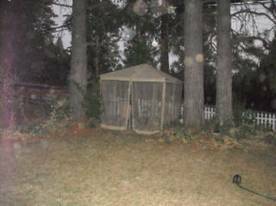 I believe Cindy photographed some orbs next to me. Next, Laura came over to try her temperature gauge and it went from 2.8 to 0. At the southwest corner in the closet, Laura�s gauge went from 0 to 0.9 to 0.8 to 0 and both Laura�s and Wayne�s camera batteries went dead. At the end of the bed, both Wayne and Scott tripped over something at the same spot, but nothing we could see was there. There was a cold spot where they tripped. Next we moved to the downstairs bathroom by the stairs. I sensed something above us hovering. I didn�t like the feeling I was getting from it, but I can�t quite explain it either. Not having a meter with me we would have to disregard anything there for now. �My first impression of a spirit was of a male with gray hair and glasses. He was dressed in what looked like just a simple shirt tucked into his pants. I had the feeling this male could have been more recent and connected with someone living in the house. I saw him upstairs, not in the rooms, but just walking in the hall, my feeling is that he is friendly and loving and he just circles the opening of the bedroom doors just to make sure everyone is okay. I was wondering if he could be a father or grandfather, but again, without equipment with me when having these feelings, I was unable to substantiate? The area from the top of the stairs down to the landing are very active, it also goes into the hall. With the meters we were able to confirm that the majority of the energy felt when we were there was upstairs. When I entered the master bedroom I opened the closet near the entry door to show the little cubbyhole. I have to say a chill went up the back of my neck. I saw a young girl of about 6 years old with dark wavy hair. �The most profound things I picked up being the new kid on the team and from the Camino investigation was the emotional release that the people who lived in the house and participated in the investigation experienced from the heartfelt and thorough investigation that took place. As far as I could tell there were 2 major vortex areas that could be the same huge vortex. One outside the house in the back and one upstairs in the master bedroom just above it. However, it seemed there was an abundant amount of activity which made me wonder....what the f� happened in this place? Really! To the most part there was an almost negative impression in some areas, yet many areas again were not a negative force at all. I was especially drawn to the little girl spirit. I found myself wondering of some type of overall clearing needed to be done on the property. Again I really enjoyed watching the crew work and being a participant as well. This investigation proved to be very productive and a very haunted home and property. On the scale from 1 to 10 this one would have to show as a 9 in most criteria to what we are looking for when investigating. Lets� break it down. First of all, as a paranormal investigator, I have to disregard any �impressions� that the crew might have thought they saw unless they could back it up with meter readings not effected by wall sockets and other natural occurrences, and/or photo sightings. Not that they were wrong, spirits move about and at one time might be somewhere and then gone. Even though I have left their impressions in this article for you to read, for a team of investigators that works on FACTS, when unsubstantiated we eliminate as we have no proof of existence. When the property dwellers told of electrical things happening, lights going out, recorders going off and on by themselves, I had our electrical specialist look for signs of electrical malfunctions within the walls and outlets. It showed nothing abnormal. When people talk of bangs and unsettling noise, the first thing that comes to mind is a house settling. Being on a foundation for such a long period, this house would fall into that category for possible simple settling. The house did prove to 2 or more inches off on one side which could account for some of those findings. 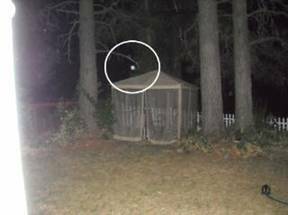 As you will see from our meter readings and the enclosed photos, there was certainly something of unknown origin going on there that we were unable to pinpoint in some cases. As there are TWO types of entity activity, we need to identify one from the other. GHOSTS are an IMPRINT, measured in time. The same activity from one entity will repeat over and over. The actual person is not there any longer just the essence of when they WERE there still remains like a video tape that keeps repeating. Obviously you cannot communicate with a ghost, it is simply an imprint. A SPIRIT on the other hand, is a deceased person or animal that is for whatever reason sticking around, or coming back, to one destination or another. Sometimes they are just lookieloos! However, in any case, and if they CHOSE to, you CAN communicate with a spirit, as the deceased person is actually there. The man in the closet in the master bedroom and the little girl in the opposite cubby hole closet on the other side of the room are cross-overs of ghosts and spirits. They once DID live in the house, and they COME BACK in spirit form, sometimes at the same time, and sometimes not. The little girl�s image as a ghostly entity is frightened of the man, obviously, for her hiding from him in the closet. The male, from his ghostly imprint is dark, strong stepped and cold, showing a rather harsh persona. From the spirit perspective of the little girl, coming back, she is impish, curious and gadabout. She from the spiritual perspective is not frightened of the male or having any recognition of her lifetime with him. The universe is gracious in that way, remembrances of bad things are desolved for the young at death. From the spirit side of the male, his perception and aura remains the same, cold, dark, a person always needing to be in control. A smack of cruelty comes up with him, and an attitude of things having to be done his way. Of course, spirits as well as ghosts cannot harm you unless you have great fear and the fear alone sets you off balance, but it would be a force that I would want removed from my home, because he is a disruption in good clear energy. There was a female, a mother figure that it appears the little girl hides from also, and voices on our EVP�s detected quarreling between a male and female. From a psychic perspective it appears the little girl is the product of both of the above mentioned, and she is hiding from the fighting. I believe the father was not opposed to hitting her either, he was the type. Somewhere in this scenario there existed in this house a wrongful and harsh religious overtone, and not from the current occupants, obviously. Religious doctrine will either bring out the crazies or a good feeling this one from our meters was abusive toward women and clearly male dominated. This would be very sad for any woman of that time or this, who would be bullied into submission and degraded as second in importance. Sadly we even see some of that today. But again, this is NOT the impression or problem of the current occupants so it is embedded into the walls from another time. It would take much weaker mental capacities than those currently in the home to fall victim to that today. Still, I personally would have that energy removed. I feel this problem with male dominated religion is also a cross-over that the ghost of the little girl has been hiding from. We intend to ask the occupants if a house clearing of negative energy would be okay. The little girl is dark haired and slender. The hair appears to have a slight wave to it, thick and very pretty. She has long legs and is gangly. She will grow out of that stage obviously as a teenager. The man figure, the father, is tall, not especially heavy, he has what appears to be dark skin, wrinkles around the eyes and the eyes are dark and penetrating. He has long fingers, and is wearing a dark suit and hat. If I did not know better, I would think he was an undertaker or a preacher, believe he was a part of an organized religious sect., but I more see that he was of authority in whatever job he had When he was seen in his ghostly form coming from the closet across the room and right through our investigations, the ghostly little girl hid as far back in the cubby hole as she could to get away from him. She tucked her legs under her and hid her face with her hands. The wife of this man is stocker, not fat, just big boned and has reddish/light hair with gray flicks. It sits on top of her head with a pin in it, and the strands fall down into her face. She was not in the room when this insodent happened to her child, although I do not think she would have done anything to stop it in the face of her husband as any respectable woman today would. In her lifetime she was hard working and quiet. She kept the table set and a clean home. In the living room I found several family members that had passed, and I told the household members about them. A mother who passed in our lifetime spoke of a way her son could now know when she was around. A lighthearted juggling inside the cupboards in the kitchen reminded us that there is a female entity that loves to be in the kitchen. She is happy with the old cupboards but unhappy with changes that have been made to the kitchen. Her energy could be felt going from one side of the room to the other, circling and criss-crossing impatiently right through all of us as the interviews were being conducted. She was wearing blue, light blue, an apron of white with some sort of decoration likely sewed or stitched on it. There were two names that came up from this, a woman with a name that started with an M, and Helen. Walt was a man who sat in that kitchen from past history. There were two spirit men I saw in the front yard. Both appeared to be either Hispanic or Indian. Both were dressed in working clothes, their skins were very lived in, sun baked wrinkled and set. They both appeared happy, but I can tell you that there are several dogs and cats buried in the front and back yard. There are ancient bodies of pigs, goats, cows, deer, elk (not indigenous to this area at this time) and bears. It brings to me a feeling of great pain and sadness. In this front yard I could see that many years ago it was a tent city of sorts, people going from one place to another. There appear to be beatings going on and fist fights and harsh words on occasion. There were more men than women, and children running around. There were a few horses about, and a stock fire in the middle. It would be interesting to dig up the yard and see if rocks with fire marks burned into them still exist. Certainly there are bodies there. Copper Rods are not the most reliable paranormal tool. Still, in a pinch, they can help find energy. EVP readings are as followed: Joey was to have limited success with our equipment. The question he posed was: �Is there a family here?� The EVP replied, �THOMPSON�. On another question asked by Joey, it being �What are the names of your cats?� On review of the EVP with our extended equipment we could clearly hear a young girls voice say � MICHAEL.� Though we do not think she replied to the question, her cats name was not Michael, she was responding never-the-less by giving us a name. �When we went into the yard, Nancy and I were accompanied by Kevin (Watson), one of the property residents. At that time I wasn�t holding any equipment. When we entered the yard, I began to feel a slight sense of nausea; this happens every time I go there. The longer we stayed the more intense that feeling became. After about five minutes I began to feel dizzy and the onset of vertigo. Upon leaving the yard I began to feel better. emotionally, I have always felt a sense of discord over there; a cacophony of emotional turbidity. It�s hard to describe, but it is like going to a densely humid place for the first time where the air is uncomfortable and heavy. Only in this place, it is not the air that is heavy, but the emotional weight in my chest. After the three of us left, I went back over with a small digital recorder that was handed to me by Robert Reppert. I went alone for an EVP session. For about 3 minutes I asked various questions in the emotional/nauseating �hot spots� when I noticed that a previously full recorder battery was not just about dead. As I asked those questions I felt, what I can only describe as pulses, slight waves of vertigo washing over me. I felt pretty good about the EVP session, as the battery had been drained and I was fairly nauseated by the time I walked back to the house. I went back a third time that day, when I took the team over to show them the yard. I stayed on the sidelines (partly to comfort the anxious dog in the neighboring yard and partly because I had enough of the sick feeling I get from being in that yard too long). I listened to various team members, in turn, complain of electronics failures in digital cameras, voice recorders and video devices. Unsurprisingly, all happening in the locations where Nancy and I felt the most dizzy and activity upon her initial visit, and where my own voice recorder had failed.� NOTE: There had been no conversation between myself and any of my crew concerning this part of the property. When I first arrived at the property I was greeted by Joey and we decided to immediately go to the yard in which he had felt the vertigo. I was anxious to put that yard into perspective for him and release whatever energy was there that was disruptive. When we walked down the side road/path toward it I was able to feel the vertigo the closer we got to the place in question. At one time in the yard I held onto the men to keep from being off balanced. 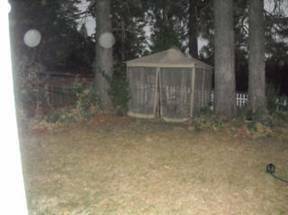 As there is a definite difference between spirits, ghosts, and simply the shell of bodies, I could immediately feel three bodies buried there, one directly under the shed, another along the fence, and one toward the picnic table. The one near the picnic table was NEWER, because the energy was stronger there. All three bodies emitted energies of strong ghostly imprints, meaning the deaths were not easy ones. Was there something sinister about these deaths? Certainly the one near the picnic table. And it appeared this body had been dug up and moved, still leaving the imprint. And in that same yard there were bodies of animals, pets. A bronze toned, yellow, light fur spirit dog followed us around as did a two- toned cat. A living dog behind a fence continued to bark insistently. They though it was because we were there, and likely so. Still, the living dog was barking at the deceased one and wanting to get at the cat. There were other animals buried there that came to show themselves to me, but being dizzy on the site kept me from acknowledging them all. One I do remember was a dark large dog that had been shot. I put my hand out to it because I hate animal cruelty, today or before, and was happy the dog was in peace on the other side. There was another dog that had died on the road not too many years passed as well as several cats and they are buried on the property. It would be interesting to get a probe and see where and if the bodies are still there. Years ago bodies were buried in wooden boxes, and as the boxes decayed and caved in, it would leave an indentation on the ground making it easy to see where people were buried. We did not find much of that here as there has been so much activity in this yard, dirt moved and such. Still, I am certain with a little effort the bodies of those interred could be identified. The man buried near the picnic table was buried without the formality of a box. Article Copyright� Nancy Bradley - reproduced with permission. Did an extraterrestrial craft land in Russia's Yuzhny Park in 1989 ? Sean Casteel investigates what might lie behind the infamous Amityville horror case. Kathleen Meadows reviews a book by author Karen Hamaker-Zondag. Sean Casteel explores the story behind the UFO informant known as 'Commander X'. Keathleen Meadows explores Tarot cards and Buddhism. A look at one of Russia's most enduring enigmas. Was inventor Nikola Tesla a UFO contactee? Sean Casteel takes a look at the life of Nikola Tesla. Kathleen Meadows discusses how to set goals for the coming year. Sean Casteel explores spiritualism and its relation to UFOs. Kathleen Meadows talks about her life and experiences. Is there really a treaty between ET and the US government ? The radio DJ and journalist had many UFO encounters. Tales of 'demon dogs' and other beasts have been reported for years. Kathleen Meadows recalls some of her more difficult clients. Edward Crabtree takes a look at the 'Mandela Effect'. A look at the story of the Eighth Earl of Clancarty. Kathleen Meadows talks about how she intuitively predicts when someone will die.